It was another great World of Concrete for Power Curbers & Power Pavers during the 2016 show, held February 2-5 at the Las Vegas Convention Center. We displayed the Power Curber 5700-C, the number one selling curb & gutter machine in the world. Also in the booth was the Power Curber 5700-C-MAX with a barrier mold and the Power Paver SF-1700, set at 7.5 m (24.5 ft) width for road paving. The 5700-C and SF-1700 were equipped with the Topcon Millimeter GPS system, while the 5700-C-MAX was shown with the Leica stringless machine controls. 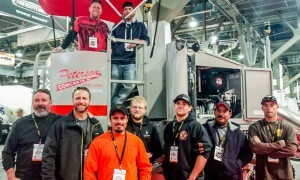 Gene Peterson and his crew from Peterson Concrete in Lehi, UT, visited the booth to see their new 5700-C, which was on display at the show and delivered to them at the end of the show.